The men’s football World Cup is about to kick off for the 21st time in Russia. 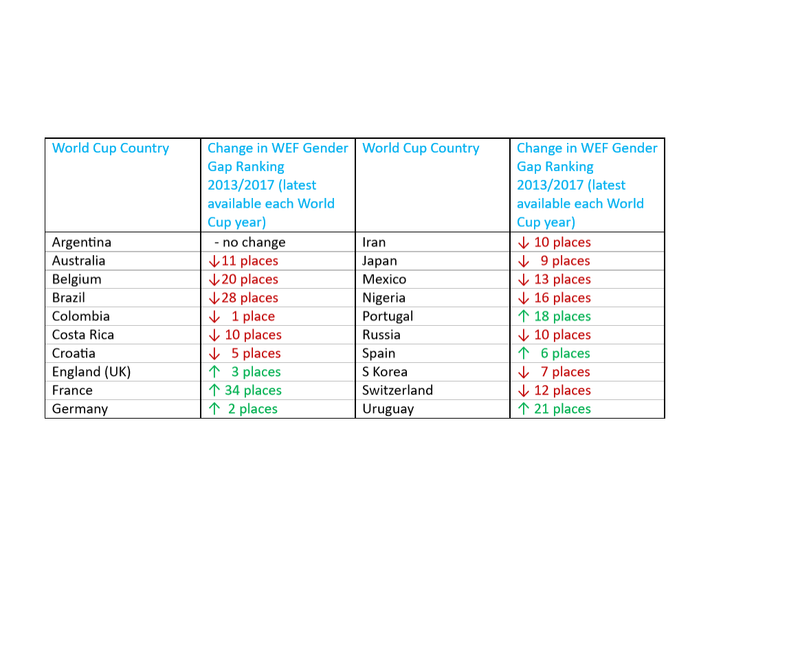 Back in 2014, when Brazil hosted the tournament, I thought it would be fun to compare how women fared in the competing countries, while everyone was engrossed in the male game. 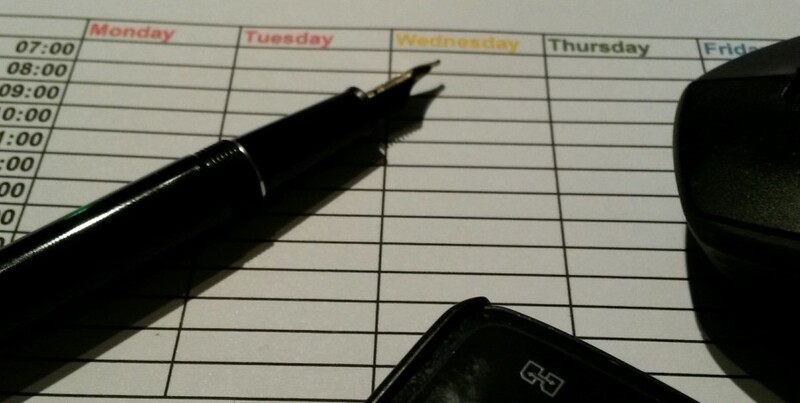 I collated a few indicators and wrote a blog. It seems only natural to return, and see how we are doing in 2018. Of course, each time there’s a World Cup, the participating countries change. So it’s impossible to compare all of the same countries over time. This year’s teams are quite an interesting spread, with 20/32 having taken part last time, and two first-timers: Iceland and Panama. The competition will feature the highest number of Nordic countries ever (3 – Denmark, Iceland and Sweden) alongside the highest number of Arabic-speaking countries (4 – Egypt, Morocco, Saudi Arabia and Tunisia). In 2014, none of the countries in the top 3 on this measure had parliaments with more than 40% female members, but in 2018 this is true of 4 countries. 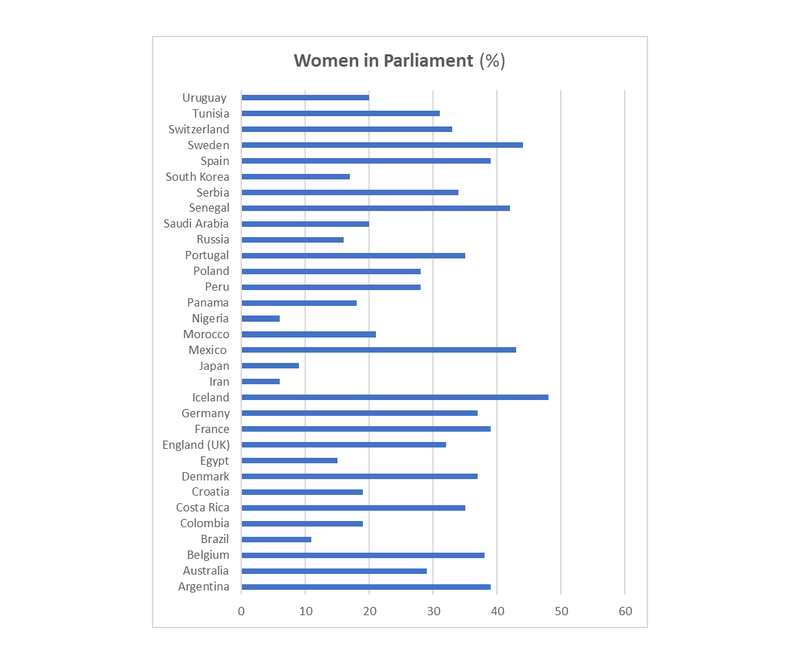 Iceland and Sweden are famous for their high rates of female representation, with 48% and 44% of members of parliament, respectively, being female; Senegal (42%) and Mexico (43%) are probably less well-known for progressiveness in this regard. Back here, I have to use UK figures for England, and the figures have gone up quite a bit, with 32% of MPs women, compared to just 22% in 2014. At the lower end of the table, Iran has doubled its proportion of women in parliament since 2014, from 3% to 6%. Nigeria is one of a small number of countries to have reversed the trend, with the proportion of women falling from 7% to 6%. In 2014, Costa Rica headed the World Cup countries’ table with 39% of its parliamentarians female, compared to 35% today. In 2018, South Korea is just about tied for the highest gender pay gap with Brazil – albeit measured on different scales. 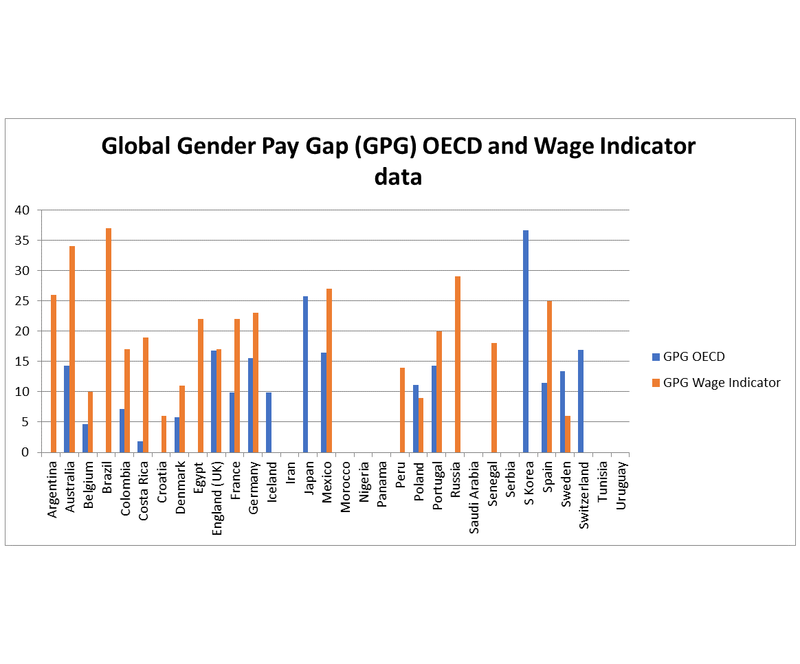 Whereas South Korea’s gender pay gap is virtually static on OECD measures since 2014, Brazil’s gap on Wage Indicator data has widened considerably. Costa Rica has the lowest gender pay gap standing at 1.8% – unfortunately there was no information for this country in 2014. However, Belgium, which had the lowest gender pay gap of World Cup countries then, has reduced its gap further, from 6% to 4.7% this year. The UK, Germany and France are still reasonably close together in the middle of the table, but France has seen a bigger reduction in the gender pay gap since 2014, dropping to under 10% while the UK and Germany remain nearer to 15% on the OECD scale. Of the Nordic countries, Denmark has the lowest gender pay gap, while data is much more patchily available for countries in the Middle East and Africa. That so many countries have fallen down the WEF Index over four years, is a reminder that gender equality is rarely achieved in a linear fashion: countries can go through periods of both progress and decline, with women’s position fluctuating over time. The tough economic situation of the last few years has probably impacted on women’s position in many nations. And it should also be borne in mind that countries tend to ‘bunch’ on health measures, like gender gaps in life expectancy, and, at the top of the index, in matters of educational equality between men and women. So changes in ranking can be particularly influenced by changes in political representation – the Russian World Cup hosts have declined in position since 2014, and rank relatively low in terms of political equality between men and women. France has recently seen increases in both its proportion of women in parliament and at the top of government, and this is important in its relatively big shift up the Index; by contrast Brazil’s political empowerment rating has dropped recently, accounting for its lower position in 2018. 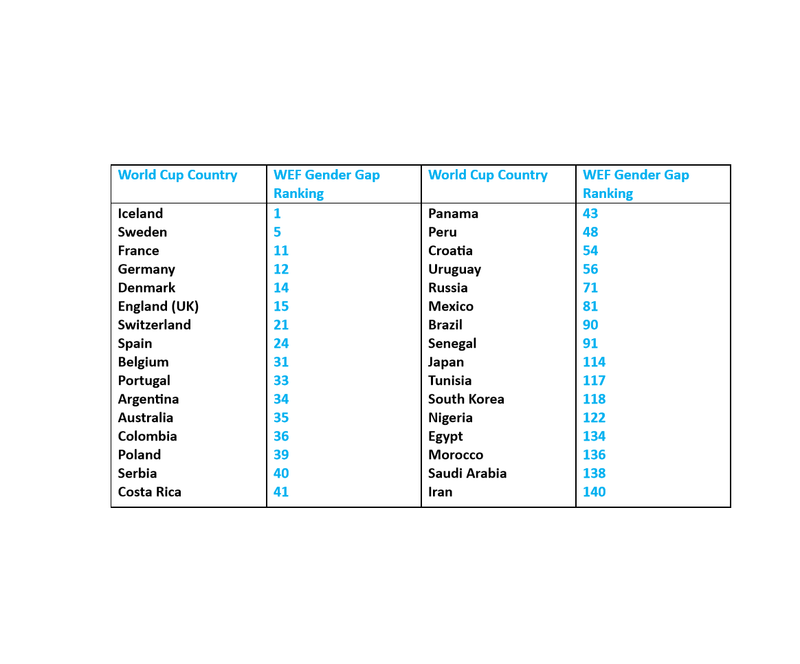 Among countries playing in the World Cup this year, but not 2014, Peru and Senegal have been making progress on the Gender Gap Index.